The Australian Open provides those of us who otherwise avoid commercial television with plenty of excellent reasons not to alter our viewing habits for the rest of the year. Sadly, infrequent exposure means we have built up little tolerance for the unrelenting vibe of ecstatic anticipation, whereby even mundane events must be imbued with an unrealistic level of excitement, like a North Korean parade. More interesting events are treated as pivotal to world history. Tonight’s semifinal between Rafael Nadal and Roger Federer was promoted as the most unmissable spectacle since the Normandy landings. Worse still are the promos for the dreadful shows the networks will inflict upon their loyal viewers in the coming weeks and months. My only exposure to these shows, or even these kinds of shows, comes at this time of year, therefore my grasp of their intricacies may be limited, assuming there are intricacies. Certainly the reality shows seem to feature arcane rule-sets, whilst conforming perfectly to the traditional mission of commercial TV, which is to bring people into your loungeroom that you wouldn’t otherwise allow in your house. Indeed, one of the shows – My Kitchen Rules, which sounds like a pun but might not be – bases its format on this very idea. Its conceit is to have a pair of contestants invite the other contestants and judges into their homes and serve them all a meal. We are thereby afforded the twin pleasures of watching people prepare food we’ll never eat, which is then consumed by people we’ll never meet. This last is a shame, because some of the table talk is sparkling. One guy does a serviceable impersonation of Jack Nicholson. There are some twins who by their own admission share a single brain, which seems an overgenerous appraisal. Last year’s champions described winning as ‘such an emotional feeling’. Some of these contestants and judges periodically turn up in the crowd at the Australian Open, where they’re expertly picked out by cameramen trained for that purpose. Bruce McAveny and Todd Woodbridge clearly know which side their cross-promotional bread is buttered on, and are diligent in revealing who these non-entities are. Jim Courier does a serviceable job of feigning interest. His job isn’t to hype Australian television shows. His job is to hype the latest instalment of the rivalry between Nadal and Federer, a task he set to with gusto. They have now played thirty-three times, and Federer hasn’t won a match in any format in almost two years, and a match in this format since 2007. 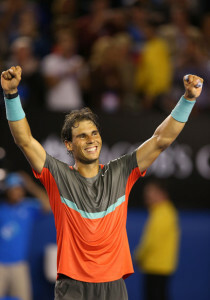 Nevertheless, a range of factors led nearly everyone to believe that their latest Grand Slam match might be closer. There was a sentimental desire in some quarters for an all-Swiss final. There was ecstatic concern elsewhere that Nadal’s blister was infinitely more severe than the blisters that the rest of us somehow put up with. There was Federer’s recent form, and Nadal’s indifferent performances against Kei Nishikori and Grigor Dimitrov. It was enough for Channel 7 to go berserk. As is often the case, the betting markets told the real tale. Nadal was the clear favourite to win, despite early reports that money was flowing for Federer, some of it in response to speculation that the Rod Laver Arena roof might be closed. The widespread belief is that Federer, when insulated from the elements, transforms into an ungovernable colossus. Being in Melbourne, I had the advantage of being able to look out my window, and knew that rain was unlikely, and that the roof would therefore be open. News came through that the RLA roof had malfunctioned. It wouldn’t open, or had gained the capacity to love, or something. Leaden quips plummeted dangerously from the sky. Roger Rasheed suggested that Federer had deliberately broken the roof, and that Nadal was up there desperately trying to pry it open. The latest vapid trend on Twitter is to declare ‘you can’t make this up’ in reference to events that anyone with a modicum of imagination could make up quite easily. It turns out you can’t make up something as wondrous as a stadium roof getting stuck. (There’s conceivably a reference I’m missing, or a substratum of irony.) Anyway, the roof eventually did open, ensuring Federer stayed at a manageably human scale. The breakdown of the Nadal – Federer matchup is by now so well-known that it barely requires reiteration. Nadal hits the ball with enormous topspin to Federer’s backhand, until Federer either makes an error or delivers a shot ball, which Nadal duly dispatches. Nadal has proven his capacity to sustain this pattern of play indefinitely without discernible risk. Meanwhile Federer can only break out of this pattern at enormous risk. This means that their matches are invariably played on Nadal’s terms. What is really remarkable is how rarely this dynamic has actually determined the outcome of their recent matches. What was surprising about tonight’s result was how readily it did. Even last year, a bad year, it was notable how well Federer’s backhand withstood the barrage. This fortnight, finally comfortable with his new racquet, his backhand has been as solid as one could hope for, without hoping for too much. Tonight, however, it was already falling apart when he arrived on court, and Nadal was masterful in denying Federer any opportunity to reassemble it. Naturally this isn’t the only dynamic at play. Arguably as important is Nadal ability to ‘reset’ any rally that threatens to spiral away, especially if it looks like draining away through his forehand corner. Whenever Federer went hard into that corner, almost without exception Nadal would respond with a high looping forehand of his own, moderately paced but very deep, keeping his opponent pinned behind the baseline, and ensuring that Federer could gain no progress within the point. There was also the latent threat of Nadal’s forehand pass. The basic rule when coming to the net is that one should never approach to Nadal’s forehand if he can run at it, stand near it, sight it, or if he is lying handcuffed on a hospital bed in traction to the side of the court. There are no exceptions. All the coaching manuals agree on this. There is nothing wrong with his backhand pass, but at least there’s a chance he’ll miss it, and it lacks the ferocious spin of the forehand. Federer broke this cardinal rule a few times, including in the final game. Whenever he was in trouble in the early going, he approached solely to Nadal’s backhand, thus delaying disaster for a time. One doesn’t thereby wish to imply that Federer approached the net recklessly, or even particularly frequently. He was often given no opportunity to move forward, but even so one searched in vain for the new ideas Stefan Edberg has apparently brought with him. Federer was arguably more aggressive last season when facing Nadal, at least in Rome (suicidally so), Cincinnati (more judicious) and the World Tour Finals. Tonight’s match unfolded more or less like any number of their matches over the last half a decade, only more so, and with due allowance for their respective levels on the night. Federer on the night played quite poorly, not quite at the subterranean level of the Brisbane final, but certainly not up to the standard he has maintained through this Australian Open. His serve in particular was less potent than he might have hoped, and all but deserted him in the first set tiebreak, though this more determined its shape than its outcome. Meanwhile Nadal played well – afterwards he conceded it was his best match of tournament – which meant that a match that was already his to lose didn’t detain us beyond three sets. There were of course many flashes of brilliance, the brightest of which was a reflexed sliced pass he produced after being wrong-footed by a fine Federer volley, which in turn shocked Federer into a coarse volley error. There were others, such as the backhand return winner in the final game, but what really drove the result wasn’t Nadal’s audacity but the long sequences of bread-and-butter rallying, in which the top seed could build pressure without ever growing incautious. After the match Nadal said all the right things, including kind words about how much playing Federer still means to him. ‘When I go on court I have very, very emotional feelings,’ he declared, proving that facing down the mighty Swiss is about as thrilling as winning a reality cooking show. (In Nadal’s defence, English is not his first language, whereas My Kitchen Rules contestants merely speak like it isn’t.) He also neatly admonished Courier for implying that he’d already won the title. He’d watched Wawrinka and Tomas Berdych slug out the other semifinal last night, and was well aware that while both men had erred, it was never on the side of caution. Nadal takes special care to regard every opponent as an overwhelming threat, including, once, Jarkko Nieminen on clay. Positioning Wawrinka as a threat is no task at all, since Stan is striking the ball with supreme authority. He is also, for the first time, the Swiss number one. All the same, the reality is that the new Swiss number one typically fares even worse against Nadal than the old one does. Wawrinka has never taken a set from Nadal in twelve attempts. If, as Courier anticipates, Nadal does win the final, he’ll become the only man in the Open Era to win all four Majors twice. Imagine how emotional that feeling will be. Thanks, Jesse. You are the Geatest Of All Tennis writers. And the funniest, too. Tennis.com should have the GOATw working for them. Thank you very much, Juan. Much appreciated. I should just read you first, Jesse, and forego the other analyses. You’re knowledgeable, witty, and a great writer. Thanks. PeRFect, as ever! Thank you.